Mini PC’s are the way to go for anyone who wants to minimize their computer size and control more elements of its constitution. Yet, not all mini PC’s are created equally, as some as more versatile than others in addition to offering more features. In this article, we discuss the top 10 mini PCs to buy on the market. Within each section, we give an overview of the product we selected and explain why it’s one of the best available. Towards the end of the article, we offer a buyer’s guide for anyone considering buying a mini PC for themselves or a loved one. When selecting the 10 products you see below, we analyzed a combination of affordability, usability, durability, features, and customer reviews. We especially valued customer reviews, as any product that received a significant number of negative reviews was disregarded from this list. While the products we selected represent the cream of the crop, there are some relative differences worth nothing that we have highlighted using a 5-star rating system. This product comes with the 6th generation of Intel’s i7 processor and Intel’s Iris Pro Graphics card. This graphics card is especially significant, as its presence translates to a more realistic viewing experience. Many users who love to watch film and television shows will love this mini PC, as it supports cutting-edge 4K resolution. This is also the preferred mini PC by many gamers, as its power can engender high frame rates which are coveted by gamers. This product also has Thunderbolt 3 technology included in it, allowing users to connect up to 3 4K displays at the same time. Many users take advantage of the graphics card on this mini PC in order to transfer large media that would otherwise transfer extremely slowly. With Intel’s NUC mini PC, even the large files that video editors often work with will transfer at close to 40Gbps. We give this product 4.5 stars out of 5. This device uses Intel’s N3450 processor and supports the Windows 10 Home operating system. Many customers purchase this product because it’s a fanless mini PC. This translates to minimal noise disturbance when using this product, which could be an important distinction for some sensitive users. We give this product 4 stars out of 5. The Azulle Access Plus can be purchased on Amazon for $189.99. This model comes with 4GB of RAM and 32GB of onboard storage. Given its small size, this mini PC is often referred to as a mini PC stick. By connecting this mini PC stick to an HDMI compatible display, users can instantly browse the web or stream their favorite content. That’s a tough deal to beat, especially when this product can fit in your pocket. The Azulle Access plus comes preloaded with the Windows 10 Pro operating system. This mini PC is powered by Intel’s Atom Z8300 (Quad-Core) processor as well as the 8th generation of Intel’s HD Graphics card. We give this product 5 stars out of 5, as it has the perfect combination of affordability, usability, and portability. This is one of the best mini PC’s due to how affordable it is. This product is so cheap that many customers buy multiple of them and give some of them away as gifts. Yet, this product’s 3-hour battery life, fingerprint reader, and ability to sync with an iPad are so appealing that these users usually keep at least one of these ingenious devices for their own usage. We give this product 3.5 stars out of 5, as it relies on Intel’s X5-Z8500 Atom Processor, which is a relatively low-end processor that is only powerful enough for basic applications like word processing. 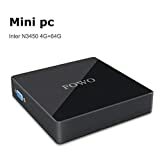 If you are interested in using this mini PC for higher bandwidth activities like streaming or gaming, then you will likely have a very frustrating user experience. In fact, some customers have noted that this product tends to overheat even when playing YouTube videos. This is an indication that this is a mini PC more to be used on the go or in a crunch. Using it to power your primary PC would be risky business. Still, because this product is so affordable and is specifically designed to work with the flagship Windows 10 operating system, many customers on a budget will be attracted to it. As such, we think it has earned its spot on this list. Customers can purchase HP’s Z2 Mini G3 on Amazon, though the price varies by how much memory you purchase as well what processor is used. One of the most popular models costs $$$ and comes with Intel’s Xeon E3 quad-core processor, 32Gb of RAM memory, and a 512GB SSD drive. This mini PC is also significant for using NVIDIA’s Quadro graphics card, giving this workstation server-grade power that is virtually unmatched in the industry. This product is even backed by a 3-year warranty, showing how confident HP is in this product. In fact, the Z2 Mini has been tested for 368,000 hours, meaning that this is definitely a reliable workstation. Furthermore, this mini PC has been and certified for use with the popular CAD software. In this sense, if you need to have the most powerful mini PC available, then the Z2 Mini G3 might just pack the heat that you need. We give this product 4.5 stars out of 5, as we subtracted half a star due to its high price tag. Over $1800 is a lot to pay for a mini PC, regardless of its extensive list of features and industry leading customer performance. This product comes with Windows 10 Pro pre-installed, making this mini PC extremely easy to use. This device supports 4K video at 60Hz. If you use this product to stream any kind of video, you will likely be blown away by the quality, as the picture is often described by users of this device as crystal clear. This is one of the best mini PCs available due to its flexible design. In particular, customers can take advantage of several slots that allow them to expand the storage memory and RAM memory on this device. This feature makes this product quite versatile, which is an asset that many mini PCs lack due to their fixed and thus limited nature. 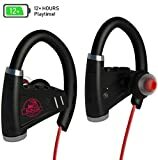 We give this product 4.5 stars out of 5, as its affordability and quiet design make it one of the best products currently available for purchase. ​This model comes with the 7th generation of Intel’s i7 processor, 16GB of RAM, and a 500GB SSD drive. 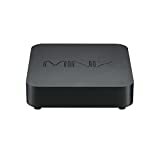 This is one of the best mini PC’s available due to all the various configurations available. Customers have a number of different drive options as well as processor options, making this product very dynamic. Many customers will be able to configure this mini PC to better meet their needs, which is a feature that many low-end mini PC’s don’t offer. Customers that purchase this mini PC also have the added benefit of buying a product from Lenovo. Lenovo is a highly reputable company in the electronics industry that is known for manufacturing consistently reliable products. In this sense, if you are looking to purchase a mini PC that you can trust in times of stress, then this might be the perfect product for you. The Alienware Alpha R2 can be purchased on Amazon for $595 for a model with a 1TB HDD (hard disk drive). Customers can also purchase a model with 256GB of SSD (solid state drive) memory for 639.99 or a certified refurbished model with 512GB of SSD memory for $$$. This product is specifically designed to work with the Windows 10 operating system. Many customers will be attracted to the SSD options for this product, as these cutting-edge drives are considered faster, more reliable, and more durable than their HDD counterparts. Many inferior mini PC’s don’t have this newer drive option, making this product manufactured by Dell one of the most sought-after products on the market. We rate this product 3 stars out of 5, as there was very limited information concerning the range of processors available for this product. It seems that the Alienware Alpha R2 mini PC can be purchased not only with Intel’s i3 or i5 processor but also with Intel’s i7 processor. Yet, many of the product webpages for these products on Amazon featured no customer reviews, making it difficult to gauge the first-hand experiences of this device. Dell’s website for the device for no better, as a “buy now” button was not able to be located. This represents a significant drawback that we hope Dell will fix soon. Acer’s Chromebox CX12 can be purchased on Amazon’s website for $$$. This product features Intel’s Celeron processor as well as 4GB of RAM and 16GB of SSD memory. This is described as a cloud-centric mini PC for more casual users. This device uses the Chrome OS, which is one of the newest operating systems. Many users prefer this operating system due to all the Google apps available as well as the superior security measures. We give this product 3.5 stars out of 5, as even though its affordable and highly usable, a new version is coming out relatively soon called the Chromebox CX13. Kingdel’s NC960 mini PC can be purchased on Amazon for $$$. This model comes with the 5th generation of Intel’s i7 processor, 16GB of RAM, and 256GB of SSD memory. This device comes loaded with the Windows 10 operating system. Many customers desire this product because it has dual HDMI monitor outputs, making it perfect for people who use multiple monitors when they work. This kind of set-up can get particularly chaotic when larger computer parts are used, making the small size of this mini PC highly desirable for both aesthetic and productivity reasons. At the end of the day, even though these 10 products represent the best that the market has to offer, their many features make it quite difficult to make a final purchasing decision. 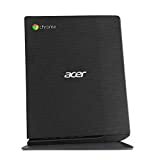 If you are on a budget and are looking to purchase a mini PC as a gift, then Acer’s Chromebox CX12 might be a good option, as this mini PC is extremely affordable because it’s an older model. Yet, don’t let its price fool you, as this machine is highly capable of fueling a smooth, powerful machine. If you are looking for a product that is similarly affordable to the Chromebox CX12 but has more minimal features, then the Kangaroo Plus Mobile might be ideal. At $169.99, this is the cheapest and simplest product on the list. Make sure that the end user of this product doesn’t need to stream video, as this mini PC is limited in that regard. If price is not an option and you are simply looking to splurge on you or your partner (or both), then we recommend Lenovo’s ThinkCentre M710Q or HP’s Z2 Mini G3. Both of these products are produced by companies with proven records of exceeding customer expectations. Going with either of these products might even financially benefit you in the long run. These products will continue functioning efficiently for many years, preventing you from having to purchase a new mini PC every few years. Regardless of what kind of device you go with, make sure you have an accompanying screen. Some users forget this vital detail, as mini PC’s are a radical concept for many. As such, we’re excited to see how this product develops in the future. Digital Poet at BurnWorld Inc. I am the Team Leader here at BurnWorld. I am an audio/video enthusiast and have been in this industry for over 10 years. I love testing DVD/Blu-Ray and Video software.